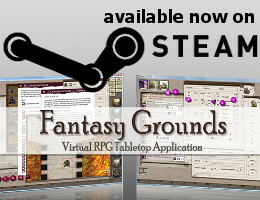 On May 10th 2014 Fantasy Grounds was made available on Steam! 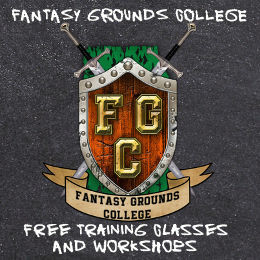 Fantasy Grounds is a hybrid application which allows you to play games and create your own games. It facilitates this play and provides some optional add-on Adventure modules which can be loaded and played with very little preparation. 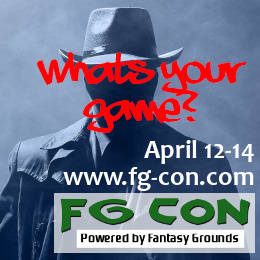 Each game will require a GameMaster (GM) and one or more players. Games may be played in a session as short as a few hours or continued with multiple sessions over a series of days, weeks, months or years. A GM will typically install the application and choose their game-system of choice, which we refer to as a Ruleset. 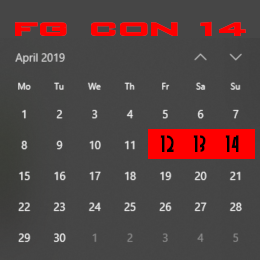 Fantasy Grounds comes pre-loaded with Rulesets for Dungeons & Dragons 3.5, Dungeons & Dragons 4E and the Pathfinder RPG. Additional Rulesets are available for free and for purchase from our Workshop. Both Dungeons & Dragons 3.5 and Pathfinder are good places to start for new GMs and for people new to Fantasy Grounds. These Rulesets come pre-loaded with some basic Library modules full of abilities, spells, monsters and items.